Thornton Wilder’s The Matchmaker – Hello Again, Dolly! Come enjoy a preview of what might possibly be a future Hudson Valley Shakespeare full-on production of famous playwright Thornton Wilder’s 1954 The Matchmaker. 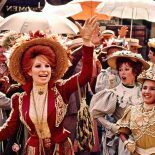 This comedy play is the precursor to the musical Hello, Dolly! It explores the character of Horace Vandergelder in more depth, and provides Wilder’s uproarious commentary on the benefits (and pitfalls) of money. After a series of slapstick situations involving mistaken identities, secret rendezvous behind carefully placed screens, separated lovers, and a trip to night court, everyone finds themselves paired with a perfect match. Acclaimed director Tyrone Guthrie won a directorial Tony for bringing this 1955 play to Broadway. Thornton Wilder’s The Matchmaker (“One of the sweetest and smartest romantic farces ever written” – Wall Street Journal) will seem awfully familiar to lovers of Hello, Dolly! Running for nearly 500 performances on Broadway in 1955, the play inspired the Dolly! Broadway musical a decade later and, in turn, the film. See where it all began! Directed by Obie award-winner Jack Cummings, our reading features Hudson Valley Shakespeare Festival fan favorites Nance Williamson and Kurt Rhoads.